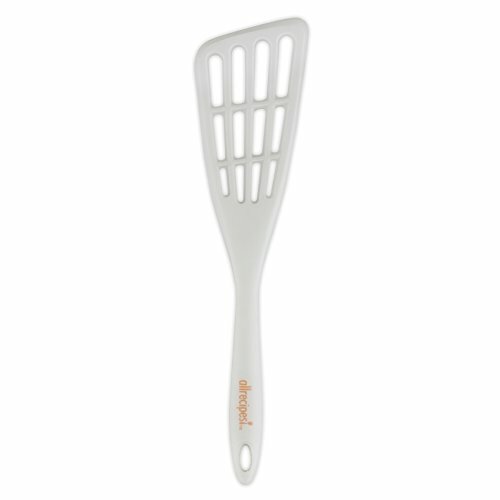 The Allrecipes Silicone Slotted Fish Turner is ideal for flipping fragile foods like fish fillets, omelets and more. The Slotted Fish Turner is safe to use on nonstick cookware and bakeware. Its flexible edges squeeze into hard-to-reach corners of pots and pans. The utensil is heat resistant up to 400°F/204°C, is dishwasher safe and measures 13.5" long. Tip from the Allrecipes kitchen: When cooking tomato-based foods or curries, soak tools in White vinegar and baking soda to help remove stains. Home cooks come to Allrecipes for everyday inspiration and practical, reliable solutions for food and cooking needs. Our cookware and kitchen products provide clever, solution-based features that remove the guesswork from cooking and make prep and cleanup easier. If you have any questions about this product by Allrecipes, contact us by completing and submitting the form below. If you are looking for a specif part number, please include it with your message.